It was basing on this same worry that the Pope made of ecumenism one of the main Pontificate’s leit-motivs. His experience of almost thirty years of guidance of the Congregation for the Doctrine of the Faith and the continuous divisions he had to face brought him to a reflection. That is that the divide among Christians is a scandal, as he repeatedly said. And that reaching for the unity of Christians, operating for the reconciliations among the several Christians groups – may they be traditionalists, protestants, evangelical - is part of the program he outlined in his first Pontifical Mass. The program of not having a legislative program, but of following the will of God. «To work tirelessly to rebuild the full and visible unity of all Christ’s followers». This is the «impelling duty» of the successor of Peter. Already in the first Message after his election to the Papal Throne, Pope Benedict XVI spoke these programmatic words. The cause of ecumenism has always been central in this pontificate. Benedict XVI often referred to the necessary «purification of the memory» and see «inner conversion» as the indispensable premise for progress on the ecumenical journey. And he always exercised ecumenical primacy in his many meetings with representatives of other Churches and Christian communities. Already as a theologian and a cardinal, Joseph Ratzinger worked very hard to ensure that the ecumenical dialogue made headway and enriched it with useful theological reflections. His ecumenical action is expressed more clearly and deeply in his interpretation of the priestly prayer of Jesus, that all may be one, of which the Pope speaks in part two of his book on Jesus of Nazareth. 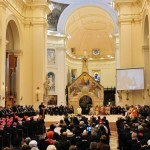 Among the many criticisms aimed at Benedict XVI, the one of ditching ecumenism no longer holds up, especially after his celebration of Vespers together with the archbishop of Canterbury and primate of the Anglican Communion, Rowan Williams, on the evening of March 10 in the Roman monastery of San Gregorio al Celio. With the Anglican Communion, the rapprochement that has been seen since Joseph Ratzinger became Pope is in some ways incredible. 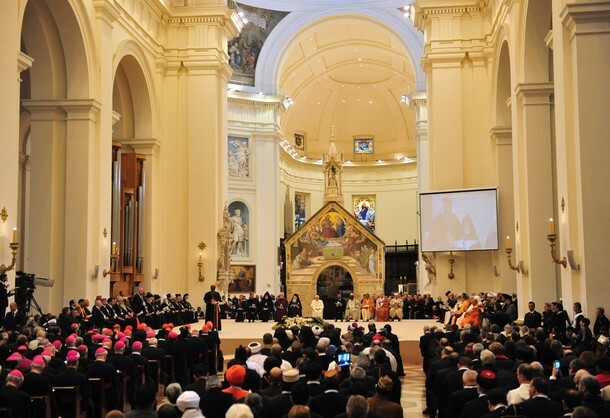 In the autumn of 2009, Benedict XVI promulgated an apostolic constitution, Anglicanorum Cœtibus to normalize the entrance into the Catholic Church of entire communities of faithful coming from Anglicanism, with their bishops and priests. Some progressive Catholic currents condemned the initiative as a gravely anti-ecumenical act: that is, as a restoration of the ideology of the «great return» and as the intention of the Catholic Church to «expand its empire» by ripping away portions of rival Churches. But in the Anglican camp, the initiative did not provoke too much rejection. The announcement of Anglicanorum Cœtibus was made simultaneously from Rome and London, here through the initiative of Anglican primate Williams himself, although he had not been part of the preparation of the document. This was followed by the entry into the Church of Rome of thousands of faithful and dozens of priests and bishops, accommodated in special “ordinariates”, two of them so far, the first in Great Britain and the second in the United States. Benedict XVI made of his pontificate a pontificate of unity, trying to repair the divides within the Church. One example: the Priest Fraternity of Saint Pius X’s case. Even the criticism aimed at the Pope of putting the embrace with the Lefebvrists in front of dialogue with the other Christian confessions can no more hold up. Even because the facts say the opposite. The Catholic traditionalist Lefebvre founded the SSPX in 1969 in answer to the reforms pushed through by the Second Vatican Council. The group has grown to include tens of thousands of followers and hundreds of priests — a «painful wound in the body of the church» Benedict XVI said. Ratzinger took care of Marcel Lefevbre and his followers since the 80s. In 1988, it seemed that the solution was up to come. After a cardinal Edouard Gagnon’s visit to Ecône - where the headquarter of SSPX is – on April, 8th 1988, in a letter addressed to the then cardinal Ratzinger designed a proposal to let the SSPX get a regular collocation in the Church. This proposal dealt with an agreement – to be signed in May 1988 – about the Liturgical Books approved in 1962 and with the constitution of SSPX in «Society of Apostolic Life». In exchange. Marcel Lefevbre assured his obedience to the Pope and his acceptance of Second Vatican Council, thus acknowledging the validity of the new rites of the Mass. The breach anyway occurred. Lefevbre was not authorized for an episcopal ordination – he wanted to ordain a new bishop that was intended to be his successor in SSPX (and this one was Fellay, that is now effectively the leader of SSPX) – and so he backtracked and decided to ordain four bishops without the permission of Rome. The ordination had been fixed for June, 29th 1988. To prevent the illicit ordination, in June, 24 1988 John Paul II gave his permission for the ordination. It was not sufficient. The 15th of August, Lefevbre wrote in a letter that he did not need just one, but three bishops. The breach was unavoidable. From then on, an important debate took place, until the revoke of the excommunication to bishops ordained without the Papal permission. It was since June 2008 that Lefevbrist asked for the revoke of the excommunication. Lefevbrist said in exchange that they would respond to the proposals of Benedict XVI to bring the SSPX into a new communion with Rome. In 2007, Pope also gave the opportunity to celebrate the Holy Mass according to the rite of 1962. And now that we reached 2012, the Pope made SSPX an offer they could not refuse: a personal prelature, with the agreement that they would accept the Second Vatican Council and the Papal authority. The answer did not come, and all the SSPX statements have been interlocutory and nothing let think about a rapprochment. All the efforts have been done. Yet, the internal divisions inside the same Fraternity and the waywardness for claiming to always be on the right track incredibly brought to keep the breach, nevertheless the Papal efforts. «The ambition for the unity of Christians is in the first place a spiritual reality, and this is the reason why its heart is the spiritual ecumenism». It was 2009, and Walter Kasper was still president of the Pontifical Council for the Promotion of the Unity of Christians. «Spiritual ecumenism» had long become is watchword. More than looking at the documents and at the big ecumenical meetings, Kasper had come to look at what was built from the bottom up: he looked at the ecumenical networks born from communities and ecclesial movements, and it compared it to a sort of «back to the origins» ecumenism. In fact, originally ecumenism was brought on by small groups of dialogue, prayer and biblical studies. «Next to (the increasingly difficult) official dialogue, new promising forms of dialogue are arising», Kasper said. That also Benedict XVI thinks that ecumenism must come from the prayer was immediately acknowledged in Koln. The Pope went to Koln in 2005 – it was his first Papal trip – for the World Youth Day. In his August 19 address to the representatives of the Protestant and Orthodox Churches, the Pope on number of occasion raised his eyes from the text and improvised, adding the words to the official text. In one of these «off the cuff» passages, the Pope maintained that «now, it is said that following the clarification regarding the doctrine of justification, the elaboration of ecclesiological issues and the questions concerning ministry are the main obstacles still to be overcome. In short, this is true, but I must also say that I dislike this terminology, which from a certain point of view delimits the problem since it seems that we must now debate about institutions instead of the Word of God, as though we had to place our institutions in the centre and fight for them. I think that in this way the ecclesiological issue as well as that of the “ministerium” are not dealt with correctly. The real question is the presence of the Word in the world». Benedict XVI reprised these issues in his last trip to Germany, in September 2011. In Erfurt – where Martin Luther studied as a Catholic and decided to be an Augustinian monk – many awaited an “ecumenical gift”, and many auspicated that this gift was the revoke of the Luther’s excommunication. The Pope responded to these expectations by explaining that the idea itself of the “ecumenical gifts” is part of a wrong idea of Church, because – the Pope said – «this is a political misunderstanding of faith and ecumenism». «The faith of Christians does not rest on such a weighing of benefits and drawbacks. A self-made faith is worthless. Faith is not something we work out intellectually and negotiate between us. It is the foundation for our lives. Unity grows not by the weighing of benefits and drawbacks but only by entering ever more deeply into the faith in our thoughts and in our lives». In the end, the gift Benedict XVI carried at Erfurt was that of living the Martin Luther’s most intense question: «How do I receive the grace of God?» And he remembered that Catholics and Lutherans are less divided that what they think, that the «confessional» era has come to an end, that Christians must know how to be missionaries, that no one must ever forget that there is evil, since minimizing the evil «is not a foolishness»: it unavoidably brings man to the loss of himself and of his life. Basing on prayer, Catholics and Lutherans seem to be closest than what they appear. As close as the 80 stairs that divide the Cathedral from the Saint Severe Church in Erfurt. In Germany, ecumenism is a topical issue. No surprise that just one of this year Schuelerkreis’ rapporteur does not come from Germany. Let’s give a glance to the teacher of ecumenism of professor Ratzinger. The «hidden» rapporteur of the 3 days meeting had obviously been card. Walter Kasper. At the beginning of 2007, Walter Kasper – then president of the Pontifical Council for the Promotion of the Unity of Christians – projected with the officials of the Vatican dicastery he leaded to collect and present the results of the official dialogue with the Catholic Church and the historical protestant Churches: Lutherans and Reformed, Anglicans and Methodist. This collection was aimed to show to a new generation the fruits of 40 years of dialogue, comparing what had been realized. The project brought to the drafting of the book Harvesting the fruits. Basic aspects of Christian faith in ecumenical dialogue.. This book was the reference book for the Schuelerkreis. The book provided a scenario of the past, in order to acknowledge the great achievements of the ecumenical dialogue so that the new generation of ecumenist will not start from scratch. On the other hand, the book also provided a scenario of the future: true, «exhaustion and disillusionments» spread, and the post-Council enthusiasms seem to be far way; but it is also true that many things changed. Kasper wrote: «Sometimes partners are not the same anymore, and are very diverse by the one we met during and after the Second Vatican Council. There are internal breaches, new issues in the ethic, problems that were unknown in the past. There had been changes in the Catholic Church, as well, and sometimes our documents are difficultly acceptable for our partners». Theodor Dieter – since 1997 president of the Institute for Ecumenical Research in Strasbourg – talked about the relationship among the ecumenical partners. «I became strictly speaking an ecumenist – he recounts – when I was called to teach to the Institute for Ecumenical Research». In fact, he thread a long path to get there: educated as a strong Lutheran, Dieter always searched for a new way to tell theology, and he found his way reading the fathers of the Church and medieval theologians. Joseph Ratzinger thread a similar path on Catholic perspective, and this lead him to develop a dialogical methodology. In ecumenism, the studies on the New Testament are basical. In his book Jesus of Nazareth. From the entrance in Jerusalem to the Resurrection, Benedict XVI often quoted the protestant bishop Ulrich Wilckens, whose Theology of the New Testament was a «reference book» for the Papal work. Wilckens presented to Schuelerkreis his studies on the New Testament, that are of great importance for the ecumenical dialogue. Charles Morerod championed for years ecumenical dialogue. Now, Morerod, Dominican, is bishop of Lausanne, Geneve and Freiburg. In the past, he was part of several ecumenical tables. In an interview to 30 Giorni, Morerod explained that the problem of the Papal infallibility – topical for the Orthodox Church – comes from the fact that «faith is never the result of a poll with a prevailing majority», and that «fair and understandable statements on this issue have been written in the document for the gift of the authority, drafted from the Commission for the Dialogue among Catholics and Anglican» in 1998. That document states that «any solemn sentence pronounced from the chair of Peter in the Church of Peter and Paul can only express faith in the Church». The document also acknowledge that «bishop of Rome, in peculiar circumstances, has the duty to discern and make explicit the faith of the baptized in Communion, and only this», and that the specifical Petrine ministry of universal primate is a «gift» that all Church should accept. The Orthodox Church often focuses on the issue of the Papal infallibilty. It is not a case that the Orthodox Patriarch Kirill has often spoke of the need of a «practical ecumenism», i.e. an alliance of religions to face – putting aside the doctrinal aspect – the new challenges coming from the social and political changes of this century imbued by religious indifference and the progressive secularizing trends. This «practical ecumenism» brought the Patriarch – who was one of the contributors of the Basis of the Social Concepts of the Orthodox Church – to ask the Pontifical Council for Justice and Peace for a copy of the Compendium of the Social Doctrine of the Church. Long since a meeting between Benedict XVI and Patriarch Kirill is on agenda. Yet when Alexy II was patriarch, the relationship between Catholics and Orthodox have become less cold thanks to John Paul II, who gifted the Moscow Patriarchate with the icon of the Virgin of Kazan. This made possible that almost all the Orthodox Patriarchates assisted to John Paul II’s funeral and to Benedict XVI’s enthronement, Moscow Patriarchate included: it was an unprecedented fact in the history of the Church. Ever since Kirill became the Patriarch of Moscow – elected with a surprising majority at the synod – the openings of the Orthodox Church toward the Catholic Roman Church increased. Notwithstanding no representative of the Russian Patriarchate assisted to the ecumenical meeting in Ravenna – because of a polemic with the Costantinople patriarchate – the document on the universal role of the bishop of Rome was then approved also by Moscow. In the Ravenna’s document, the Pope was defined the protos (first) of Patriarchs, yet they did not agree on how this Papal «primate» had to be practiced. Patriarch Kirill promoted a translation in Russian of the book «Europe, Spiritual Homeland», a collection of Benedict XVI’s speeches about Europe. The steps forward are undeniable. Kirill himself – meeting the Italian Prime Minister Mario Monti in Mosca – wanted to underline that the relationships with Rome improved. Yet, the official meeting between the Pope and the Patriarch have still not taken place. An ideal, neutral place for the meeting – it was thought – was Croatia, and the occasion could have been the short Benedict XVI’s trip to Croatia in 2011. Bari was also took in consideration for the meeting – the Southern Italy town’s patron is Saint Nicklaus, who came from Myra, Turkey. Now, Finland is running for hosting the meeting. In June, Kirill met in Moscow three Christian Finnish leaders: the archbishop Leo of the Autonomous Orthodox Church; the Luther archbishop Kari Makinen; the Catholic Bishop of Helsinki Teemu Sippo. These latter invited the patriarch for an official visit in Finland, and they are confident that the Patriarch will accept the invitation. After this meeting, the three went to Rome to celebrate the 70th anniversary of the diplomatic relations between Holy See and Finland, and there they launched the idea of a possible «meeting», or even of a «joint» visit of Kirill and Benedict XVI to Finland. These are just hypothesis. On the other hand, within the Orthodox Church there is an anti-Kirill branch that bases its opposition on Kirill’s effort for ecumenism, and this is the real reason why an ecumenical meeting with Rome has not yet been organized – Kirill already met three times Benedict XVI in the Vatican (from 2005 to 2007), when he was president of the Department for external relations of the Moscow Patriarchate. Even Kirill predecessor, Alexy II, had to face an anti-ecumenical branch in Russia: in 1994 Alexy II was even requested by some conservatives members of the Moscow Patriarchate to retire from all the ecumenical organization. Kirill is undoubtedly heading toward ecumenism. The last July, 15, he went to Katyn, where Soviet NKVD killed 20,000 officials and members of the cultural-political Polish élite. For years, the bloodshed was credited to Nazis. In Kathyn, Kirill consecrated the new orthodox Church dedicated to the Resurrection of Christ. The image of Our Lady of Czestochowa – that the Polish Catholic bishops gifted to Kirill – will stand upon one of the lateral altars. Kirill got the image in Poland, where he went in August, 17-19. During the visit, Kirill and Josef Michailik – president of the Polish Bishops’ Conference – signed a document titled «Joint message to the people of Russia and Poland». They worked on the text for two years. In the text, Polish Catholics and Russian Orthodox appeals to «forgiveness, reconciliation and dialogue» in order to heal the wounds of the past and embark on «the way of spiritual and material removal». In the end of the text there is the acclamation to Christ Resurrected «hope for our Churches and for the whole world» and the request for the protection of Mary – to whom Russian and Polish are both very devout – for the great work of reconciliation and approaching «of our Church and our nations». To forgive, not to forget. Knowing the past – the document states – can so help to discover «the full truth». There is the need – Pawel Przeciszewski, an historical of international relations, maintained – a fair-minded telling of the conflicts between Orthodox and Catholics in Poland (whose borders, in 16th century, went from Baltic Sea to Black Sea), to be written by representatives of all the people that lived there: Polish, Ukrainians, Latvians, Russians, and many others. Lutheran and Catholics, a reciprocal mea culpa? Benedict XVI often made reference to the purification of memory. He talked about it even during the last Schuelerkreis. Among the ideas brainstormed by Ratzinger’s pupils during the three days of meetings – padre Stephan Horn, salvatorian, president of the Students Association, told – there was also the one of a reciprocal mea culpa with Lutheran. The Pope – father Horn explained – «always had in mind that there was the need for a purification of memory». In the homily at the Schuelerkreis final Mass is also inspired by the Benedict XVI’s trips. The Pope talked about this year’s trip in the introduction of the Schuelerkreis. «This years – Stephan Horn says – the Pope was stroke from the joy of faith he found in Benin, as well as in Mexico. Maybe in Cuba society cannot show so freely what they feel. This joy of faith raise great joy in the Holy Father. Who was also very happy for the meeting he had with families in Milan» during the International Families Meeting. Benedict XVI’s homily begins with «the joy of the law» – described in the Deuteronomy. A law – he said – « not as a constraint, as something that takes from us our freedom, but as a present and a gift». The Isreal’s law, in fact, comes from God. And – the Pope says – «This is the humble joy of Israel: to receive a gift from God. This is different from triumphalism, from the pride that comes from ourselves: Israel is not proud of her law like Rome may have been of the Roman Law that it gave to humanity, perhaps like France of the Napoleonic Code, like Prussia of the “Preussisches Landrecht”, etc. — legislation we all recognize. But Israel knows: this law was not made by her, it was not the fruit of her genius, it was a gift». The Pope follows: «God showed Israel what is law. God gave Israel wisdom. Wisdom is the art of being human, the art of being able to live well and of being able to die well. And one can live and die well only when the truth has been received and shows us the way: to be grateful for the gift that we did not invent, but that we were given, and to live in wisdom; to learn, thanks to the gift of God, how to be human in the right way». What is the essential core of law in the Church, i.e. – according to Papal words – «Israel become universal». «This nucleus – the Pope explained – is simply Christ himself, the love of God for us and our love for him and for all men. He is the living Torah, God’s gift to us, in whom we now receive all the wisdom of God» . And so «joy and gratitude» for reaching the wisdom of good should «for the fact that we can know that we have received the wisdom to live well, that it is what should distinguish the Christian. In fact, in early Christianity it was like this: being free from the shadow of groping along in ignorance — what am I? why am I? how should I move forward? — being made free, being in the light, in the fullness of the truth. This was the fundamental awareness. A gratitude that radiated around and united people in the Church of Jesus Christ». Nowadays, Church seems to look more at what comes from man than at what comes from God. The Pope says: «I think that we are precisely at that impasse in which we see in the Church only what we ourselves have made, and our joy in the faith is marred; that we no longer believe and no longer dare to say: he has shown us who the truth is, what the truth is; he has shown us what man is; he has given us the law for an upright life. We are concerned only with praising ourselves and we fear being bound by rules that hinder our freedom and the newness of life». This is a fundamental topic of Ratzinger’s Pontificate. During the last trip to Germany, the Pope – who went there «to speak about God» – even auspicated a less wordly Church in order to turn back to the joy for the true faith. The Pope warns: « I think that we need to learn anew about “not-having-the-truth”. Just as no one can say: I have children — they are not our possession, they are a gift, and as a gift from God, they are given to us as a responsibility — so we cannot say: I have the truth, but the truth came to us and impels us». It is the reverse. Christ was made man, and so «we must learn to be moved and led by it. And then it will shine again: if the truth itself leads us and penetrates us».